Carl Woese may be the greatest scientist you’ve never heard of. “Woese is to biology what [Albert] Einstein is to physics,” says Norman Pace, a microbiologist at the University of Colorado, Boulder. A physicist-turned-microbiologist, Woese specialized in the fundamental molecules of life—nucleic acids—but his ambitions were hardly microscopic. He wanted to create a family tree of all life on Earth. Woese certainly wasn’t the first person with this ambition. The desire to classify every living thing is ageless. The Ancient Greeks and Romans worked to develop a system of classifying life. The Jewish people, in writing the Book of Genesis, set Adam to the task of naming all the animals in the Garden of Eden. And in the mid-1700s, Swedish botanist Carl von Linné published Systema Naturae, introducing the world to a system of Latin binomials—Genus species—that scientists use to this day. What Woese was proposing wasn’t to replace Linnaean classification, but to refine it. During the late 1960s, when Woese first started thinking about this problem as a young professor at the University of Illinois, biologists were relying a lot on guesswork to determine how organisms were related to each other, especially microbes. At the time, researchers used the shapes of microbes—their morphologies—and how they turned food into energy—their metabolisms—to sort them into bins. Woese was underwhelmed. To him, the morphology-metabolism approach was like trying to create a genealogical history using only photographs and drawings. Are people with dimples on their right cheeks and long ring fingers all members of the same family? Maybe, but probably not. “If you wanted to build a tree of life prior to what Woese did, there was no way to put something together that was based upon actual data,” says Jonathan Eisen, an evolutionary microbiologist at the University of California Davis. Just as outward appearances aren’t the best way to determine family relations, Woese believed that morphology and metabolism were inadequate classifiers for life on Earth. Instead, he figured that DNA could sketch a much more accurate picture. Today, that approach may seem like common sense. But in the late 60s and early 70s, this was no easy task. Gene sequencing was a time-consuming, tedious task. Entire PhDs were granted for sequencing just one gene. To create his tree of life, Woese would need to sequence the same gene in hundreds, if not thousands, of different species. Woese and Fox published their results in 1977 in a well-respected journal, the Proceedings of the National Academy of Science. They had essentially rewritten the tree of life. But Woese still had a problem: few scientists believed him. He would spend the rest of his life working to convince the biological community that his work was correct. Following the publication of Linnaeus’s treatise in the 18th century, taxonomy progressed incrementally. The Swedish botanist had originally sorted things into three “kingdoms” of the natural world: animal, vegetable, and mineral. He placed organisms in their appropriate cubbyholes by looking at similarities in appearance. Plants with the same number of pollen-producing stamens were all lumped together, animals with the same number of teeth per jaw were grouped, and so on. With no knowledge of evolution and natural selection, he didn’t have a better way to comprehend the genealogy of life on Earth. The publication of [Charles]Darwin’s On the Origin of Species in 1859, combined with advances in microscopy, forced scientists to revise Linnaeus’s original three kingdoms to include the tiniest critters, including newly visible ones like amoebae and E. coli. Scientists wrestled with how to integrate microbial wildlife into the tree of life for the next 100 years. By the mid-20th century, however, biologists and taxonomists had mostly settled on a tree with five major branches: protists, fungi, plants, animals, and bacteria. It’s the classification system that many people learned in high school biology class. Woese and other biologists weren’t convinced, though. Originally a physics major at Amherst College in Massachusetts and having received a PhD in biophysics from Yale in 1953, Woese believed that there had to be a more objective, data-driven way to classify life. Woese was particularly interested in how microbes fit into the classification of life, which had escaped a rigorous genealogy up until that point. Although the field of genetics was still quite young, biologists had already figured out some of the basics of how evolution worked at the molecular level. When a cell copies its DNA before dividing in two, the copies aren’t perfectly identical. Mistakes inevitably creep in. Over time, this can lead to significant changes in the sequence of nucleotides and the proteins they code for. By finding genes with sites that mutate at a known rate—say 4 mutations per site per million years—scientists could use them as an evolutionary clock that would give biologists an idea of how much time had passed since two species last shared a common ancestor. To create his evolutionary tree of life, then, Woese would need to choose a gene that was present in every known organism, one that was copied from generation to generation with a high degree of precision and mutated very slowly, so he would be able to track it over billions of years of evolution. Some of the most ancient genes are those coding for molecules known as ribosomal RNAs. In ribosomes, parts of the cell that float around the soupy cytoplasm, proteins and ribosomal RNA, or rRNA, work together to crank out proteins. Each ribosome is composed of large and small subunits, which are similar in both simple, single-celled prokaryotes and more complex eukaryotes. Woese had several different rRNA molecules to choose from in the various subunits, which are classified based on their length. At around 120 nucleotides long, 5S rRNA wasn’t big enough to use to compare lots of different organisms. On the other end of the spectrum, 23S rRNA was more than 2300 nucleotides long, making it far too difficult for Woese to sequence using the technologies of the time. The Goldilocks molecule—long enough to allow for meaningful comparisons but not too long and difficult to sequence—was 16S rRNA in prokaryotes and its slightly longer eukaryotic equivalent, 18S rRNA. Woese decided to use these to create his quantitative tree of life. His choice was especially fortuitous, Eisen says, because of several factors inherent in 16S rRNA that Woese couldn’t have been aware of at the time, including its ability to measure evolutionary time on several different time scales. Certain parts of the 16S rRNA molecule mutate at different speeds. Changes to 16S rRNA are, on the whole, still extremely slow (humans share about 50% of their 16S rRNA sequence with the bacterium E. coli), but one portion mutates much more slowly than the other. It’s as if the 16S rRNA clock has both an hour hand and a minute hand. The very slowly evolving “hour hand” lets biologists study the long-term changes to the molecule, whereas the more quickly evolving “minute hand” provides a more recent history. “This gives this gene an advantage because it lets use ask questions about deep evolutionary history and more recent history at the same time,” Eisen says. Woese started with prokaryotes, the single-celled organisms that were his primary area of interest. He and his lab started by growing bacteria in a solution of radioactive phosphate, which the cells incorporated into backbones of their RNA molecules. This made the 16S rRNA radioactive. Then, Woese and Fox extracted the RNA from the cells and chopped it into smaller pieces using enzymes that acted like scissors. The enzymatic scissors would only cut at certain sequences. If a sequence was present in one organism but missing in a second, the scissors would pass over the second one’s sequence. Its fragment would be longer. Since RNA’s sugar-phosphate backbone is negatively charged, the researchers could use a process known as electrophoresis to separate the different length pieces. As electricity coursed through gels containing samples, it pulled the smaller, lighter bits farther through the gels than the longer, heavier chunks. The result was distinct bands of different lengths of RNA. Woese and Fox then exposed each gel to photographic paper over several days. The radioactive bands in the gel transferred marks to the paper. This created a Piet Mondrian-esque masterpiece of black bands on a white background. Each different organism left its own mark. “To Carl, each spot was a puzzle that he would solve,” Fox says. After developing each image, Woese and Fox returned to the gel and neatly cut out each individual blotch that contained fragments of a certain length. They then chopped up these fragments with another set of enzymes until they were about five to 15 nucleotides long, a length that made sequencing easier. For some of the longer fragments, it took several iterations of the process before they were successfully sequenced. The sequences were then recorded on a set of 80-column IBM punch cards. The cards were then run through a large computer to compare band patterns and RNA sequences among different organisms to determine evolutionary relationships. At the beginning, it took Woese and Fox months to obtain a single 16S rRNA fingerprint. RNA is so fundamental to life that some scientists think it’s the spark that started it all. To learn more about RNA, visit NOVA’s RNA Lab. By the spring of 1976, Woese and Fox had created fingerprints of a variety of bacterial species when they turned to an oddball group of prokaryotes: methanogens. These microbes produce methane when they break down food for energy. Because even tiny amounts of oxygen are toxic to these prokaryotes, Woese and Fox had to grow them under special conditions. After months of trial and error, the two scientists were finally able to obtain an RNA fingerprint of one type of methanogen. When they finally analyzed its fingerprint, however, it looked nothing like any of the other bacteria Woese and Fox had previously analyzed. All of the previous bacterial gels contained two large splotches at the bottom. They were entirely absent from these new gels. Woese knew instantly what this meant. He dropped the full bombshell on Fox. “The methanogens didn’t have any of the spots he was expecting to see. When he realized this wasn’t a mistake, he just went nuts. He ran into my lab and told me we had discovered a new form of life,” Fox recalls. The methanogens Woese and Fox had analyzed looked superficially like other bacteria, yet their RNA told a different story, sharing more in common with nucleus-containing eukaryotes than with other bacteria. After more analysis of his RNA data, Woese concluded that what he was tentatively calling Archaea (from Latin, meaning primitive) wasn’t a minor twig on the tree of life, but a new main branch. It wasn’t just Bacteria and Eukarya any more . To prove to their critics that these prokaryotes really were a separate domain on the tree of life, Woese and Fox knew the branch needed more than just methanogens. Fox knew enough about methanogen biology to know that their unique RNA fingerprint wasn’t the only thing that made them strange. For one thing, their cell walls lacked a mesh-like outer layer made of peptidoglycan. Nearly every other bacterium Fox could think of contained peptidoglycan in its cell wall—until he recalled a strange fact he had learned as a graduate student—another group of prokaryotes, the salt-loving halophiles, also lacked peptidoglycan. 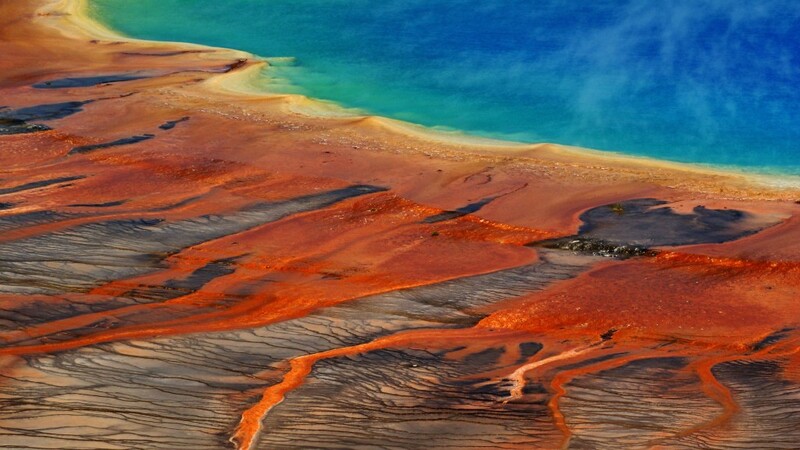 Grand Prismatic Spring in Yellowstone National Park is home to many species of thermophilic archaea. Fox turned to the research literature to search for other references to prokaryotes that lack peptidoglycan. He found two additional examples: Thermoplasma and Sulfolobus. Other than the missing peptidoglycan, these organisms and the methanogens seemed nothing alike. Methanogens were found everywhere from wetlands to the digestive tracts, halophiles flourished in salt, Thermoplasma liked things really hot, and Sulfolobus are often found in volcanoes and hot, acidic springs. Despite their apparent differences, they all metabolized food in the same, unusual way—unlike anything seen in other bacteria—and the fats in the cell membrane were alike, too. When Woese and Fox sequenced the 16S rRNA of these organisms, they found that these prokaryotes were most similar to the methanogens. “Once we had the fingerprints, it all fell together,” Fox says. Although some specialists were quick to adopt Woese’s new scheme, the rest of biology remained openly hostile to the idea. It wasn’t until the mid-1980s that other microbiologists began to warm to the idea, and it took well over another decade for other areas of biology to follow suit. Woese had grown increasingly bitter that so many other scientists were so quick to reject his claims. He knew his research and ideas were solid. But he was left to respond to what seemed like an endless stream of criticism. Shying from these attacks, Woese retreated to his office for the next two decades. “He was a brash, iconoclastic outsider, and his message did not go down well,” says Moore, the Yale RNA chemist. Woese’s cause wasn’t helped by his inability to engage critics in dialogue and discussion. Both reticent and abrupt, he preferred his lab over conferences and presentations. In place of public appearances to address his detractors, he sent salvos of op-eds and letters to the editor. Still, nothing seemed to help. The task of publicly supporting this new tree of life fell to Woese’s close colleagues, especially Norman Pace. But as technology improved, scientists began to obtain the sequences of an increasing number of 16S rRNAs from different organisms. More and more of their analyses supported Woese’s hypothesis. As sequencing data poured in from around the world, it became clear to nearly everyone in biology that Woese’s initial tree was, in fact, been correct. Woese died on December 30, 2012, at the age of 84 of complications from pancreatic cancer. At the time of his death, he had won some of biology’s most prestigious awards and had become one of the field’s most respected scientists. Thanks to Woese’s legacy, we now know that most of the world’s biodiversity is hidden from view, among the tiny microbes that live unseen in and around us, and in them, the story of how life first evolved on this planet. NOVA is the highest rated science series on television and the most watched documentary series on public television. It is also one of television’s most acclaimed series, having won every major television award, most of them many times over.